One of the highlights of 2015 was the Lecturing Tour that The Optical Foundation organized. 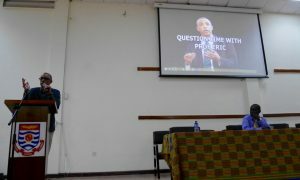 We invited Professor Eric Papas to present at two universities (University of Cape Coast and Kwame Nkrumah University of Science and Technology) and at the Ghanaian Optometric Association in Accra. His presentation included work published from the Tear Film and Ocular Surface workshops on meibomian gland dysfunction and contact lens discomfort. The lectures went on for approximately 2 hours and the students and optometrists listened with rapt attention. Students and optometrists came up with many questions afterwards and were very excited to meet Prof Eric Papas. There were optometrists that traveled 6 hours to attend Prof Eric Papas’ presentation! It was a very successful and inspiring week. Watch also the video impression of the lecturing tour. “What I found in Ghana was amazing! Beautiful lakes, dramatic beaches, bustling markets, intense history and Red Red…… but most of all, truly fantastic people. 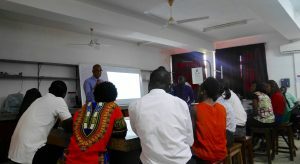 My trip lasted only for ten days but during that time, expertly guided by Carolina Kunnen from The Optical Foundation, I managed to visit Accra, Kumasi and Cape Coast. We travelled by bus, which gave a marvelous opportunity to see the country outside the busy streets of the major cities. The tour was a bit of a whirlwind but we packed in lectures to the students at Kwame Nkrumah University of Science and Technology and University of Cape Coast and the clinicians of the Association of Optometrists and also visited clinical sites at Jachie, Ayeduase and Korle Bu hospital to see how eye-care is delivered in the community. Everywhere we went the welcome was warm and friendly and I could not have been more impressed by the enthusiasm, professionalism and thirst for knowledge among those we encountered. The commitment to patient care and service delivery that I saw demonstrated at every level, from students, through teachers to practicing clinicians, was fantastic and is making a real difference. A great example of this was the undergraduate student who approached us with plans for providing outreach vision screening in a remote rural area; a wonderful idea that has since been made to happen. 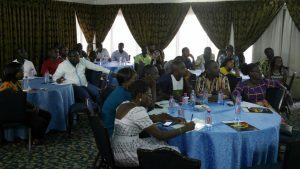 Ghana presents a challenging environment for health care but it is compelling how much benefit comes from the hard work of the professionals in the area and their careful use of the scarce resources available to them. Hopefully our visit did a little bit to help.